But the only problem is that we never have found a good solution for where to put them all. We have tried little racks to put by the door but they either break or there isn't enough room for them all so it just becomes a shoe disaster. 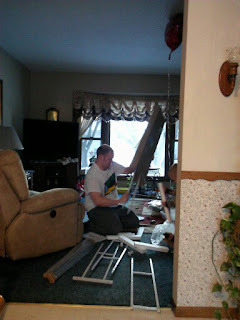 The shelf looked daunting to put together at first but once my husband (and the kids) started working on it, it actually was really easy and was put together in about 15 minutes! This shoe rack is perfect for summer sandals, winter boots, party pumps - store dozens of pairs, in or out of their boxes, on this compact Shoe Rack. It has sturdy powder-coated metal frame that adjusts to fit boots or shoes. Assembly with tools required. 62¼"Hx35½"Wx12"D.
Once again, BrylaneHome has come to save the day. 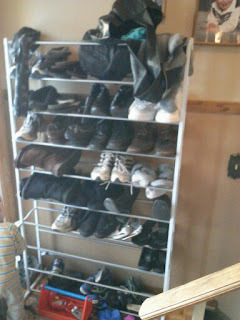 Not only do they have great products for parties and the holidays, but they now have solved our family shoe problem! :) Make sure to head over and check out their great selection of products for your home and follow BrylaneHome on Facebook! 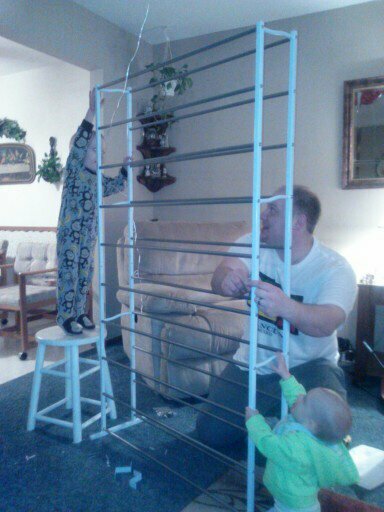 Buy It: You can purchase the 50-Pr Floor Shoe Rack for $49.99 from the BrylaneHome website.